Lincoln Park’s residential streets are among the most beautiful in Chicago. Towering trees, shaded sidewalks and rows of elegant, wrought-iron gates preserve the neighborhood’s historic charm. Lincoln Park real estate is a mix of three- and four-story conventional flats, single-family townhomes, contemporary courtyard condominiums and high-rise residential buildings offers everyone from young working singles to beginner families to empty-nesters a place to call home. The neighborhood is like a miniature city in itself, boasting almost every conceivable type of shop, restaurant, or entertainment form one can imagine. The neighborhood enjoys the reputation as one of the most ideal Chicago neighborhoods to raise a family. Within just a few blocks of each other one can spend a day at the Lincoln Park Zoo, romp with the kids at Oz Park, visit the Lincoln Park Branch of the Chicago Public Library or spend the day shopping on Armitage street which hosts boutiques,restaurants, and businesses. 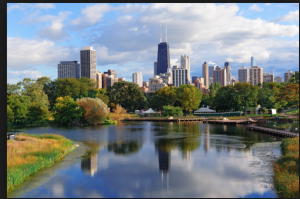 Lincoln Park is also attractive to families as it boasts some of the city’s best public schools and is also walking distance to many of Chicago’s most desired private schools. Lincoln Park, is largest public park in Chicago and the neighborhood’s namesake. Lincoln Park, the park, contains lakeside beaches, a bird sanctuary, botanical gardens, playgrounds, golf courses, tennis courts, boating facilities, open areas for football, baseball, soccer, horseback riding, and much more. The neighborhood also has a thriving nightlife and entertainment abounds. For one thing, Lincoln Park is home to the world-famous Second City Theatre, birthplace of comedy legends too numerous to list here. If comedy’s not your cup of tea, how about the equally world-famous Steppenwolf Theater, home to some of the most respected actors on stage or screen. Then there’s any one of the three arthouse/historic movie theaters in the area, the most famous of which being Chicago’s notorious Biograph Theater, where John Dillinger was gunned down by the FBI. Add to this the bars, clubs, restaurants, boutiques, curios shops, bookstores… the list is endless! Any homes in Lincoln Park are brownstones and graystones, a significant number of which have been turned into condominiums.